Roche Bobois’ signature sofa, the Mah Jong, began life in the 1970s. This decade was characterised by a new-found freedom; of expression, of lifestyle, of thinking. In this climate of free thought and liberation, artist Hans Hopfer made his vision of modular seating into reality. Based on three core components, the seating had the freedom to be swapped and reconfigured to suit changing moods and needs. The units could be an armchair, a sofa, a stool, a chaise lounge or a bed. The design was so simple and yet so effective that it continues to influence sofa design today. 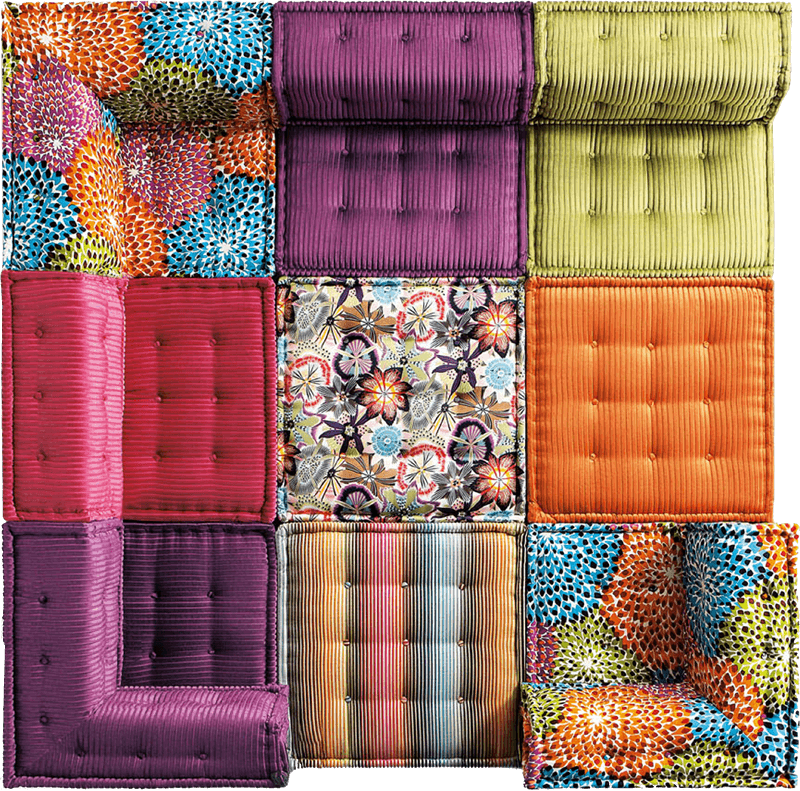 With Roche Bobois’ trademark quality, the Mah Jong is handmade in Italy, using exclusive fabrics and great attention to detail, but that’s not its only selling points. What makes it an interior design ‘must-have’ is its iconic design combined with contemporary flair. In the spirit of celebrating this design classic, Roche Bobois recently invited select creative partners to ‘dress’ special editions of the units and in doing so, has given this modular seating collection a new life through these exciting collaborations. Italian fashion house Missoni Home has created a flamboyant mix of zigzag patterns and florals reviving 1970s boho chic for a modern interior. Sonia Rykiel Maison’s alternating splashes of colour with black stripes creates surprising warmth and depth, conjuring images of neon signs against an inky night sky. And Jean Paul Gautier’s signature naval stripes and sailor tattoos create a clean monotone look with a distinctly nautical feel. It is the mix and match versatility of the coverings and the units themselves that is the real draw however. Block colours next to stripes or florals look bold, vibrant and effortlessly stylish. Never failing to surprise amidst a riot of pattern and colour, the Mah Jong has the ability to be simple, clean and elegant, all at once. In a modern setting, this brings individuality and energy to a setting, something we can imagine Hans Hopfer wholeheartedly approving of.